Who doesn’t want a healthy immune system? (Raise your hand. No one?) But did you know the role your diet plays in keeping it in top shape to protect you from toxins and infections? Sadly, too many of us don’t eat enough of the fresh fruits, vegetables and other foods we need to keep ourselves healthy year-round. You can’t just eat an orange or grapefruit and expect one quick burst of vitamin C to prevent a cold. A truly healthy immune system depends on a balanced mix of vitamins and minerals over time, plus normal sleep patterns and a hefty dose of exercise. With some exceptions, it’s best to get your vitamins and minerals from your food rather than in pill form. Here are some tips for getting the top vitamins and minerals your immune system needs to perform. You probably know about vitamin C’s connection to the immune system, but did you know you can get it from much more than just citrus fruits? Leafy green vegetables such as spinach and kale, bell peppers, brussels sprouts, strawberries and papaya are also excellent sources. In fact, vitamin C is in so many foods that most people may not need to take supplements unless a doctor advises it. Like vitamin C, vitamin E can be a powerful antioxidant that helps your body fight off infection. Almonds, peanuts, hazelnuts and sunflower seeds are all high in vitamin E. So are spinach and broccoli if you prefer to increase your intake through meals rather than snacks. This important vitamin — part of nearly 200 biochemical reactions in your body — is critical in how your immune system functions. Foods high in vitamin B6 include bananas, lean chicken breast, cold-water fish such as tuna, baked potatoes and chickpeas. Bring on the hummus! For vitamin A, go colorful. Foods that are high in colorful compounds called carotenoids — carrots, sweet potatoes, pumpkin, cantaloupe and squash — are all great options. The body turns these carotenoids into vitamin A, and they have an antioxidant effect to help strengthen the immune system against infection. As mentioned above, it’s best to get most of your vitamins from food, but vitamin D may be the exception to that rule. You can increase your intake through foods such as fatty fish (salmon, mackerel, tuna and sardines) and fortified foods such as milk, orange juice and cereals. Many people have a hard time absorbing vitamin D from food, so if you have a vitamin D deficiency, talk to your doctor about supplements. Folate is the natural form, and folic acid is the synthetic form, often added to foods because of its health benefits. To get more folate, add more beans and peas to your plate on a regular basis, as well as leafy green vegetables. You can also get folic acid in fortified foods (check the label) such as enriched breads, pastas, rice and other 100 percent whole-grain products. Iron, which helps your body carry oxygen to cells, comes in different forms. Your body can more easily absorb “heme iron,” which is abundant in lean poultry such as chicken and turkey, plus seafood. But never fear, vegetarians: You can get other forms of iron in beans, broccoli and kale. Selenium seems to have a powerful effect on the immune system, including the potential to slow the body’s over-active responses to certain aggressive forms of cancer. You can find it in garlic, broccoli, sardines, tuna, brazil nuts and barley, among other foods. You can find zinc in oysters, crab, lean meats and poultry, baked beans (skip the kind with added sugar), yogurt and chickpeas. 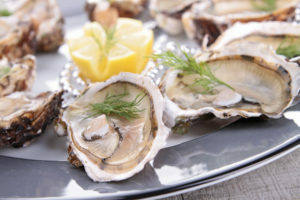 Zinc appears to help slow down the immune response and control inflammation in your body. Depending on where you live and what time of year it is, you can’t always get your hands on high-quality fresh produce. Keep this in mind: Frozen is fine. Manufacturers freeze frozen fruits and veggies at “peak” ripeness, which means they’ll pack a similar nutritional value as their fresh counterparts. Just choose plain frozen foods rather than those with added sugars or sodium.